Taken with my phone, near the newspaper in Sun City. 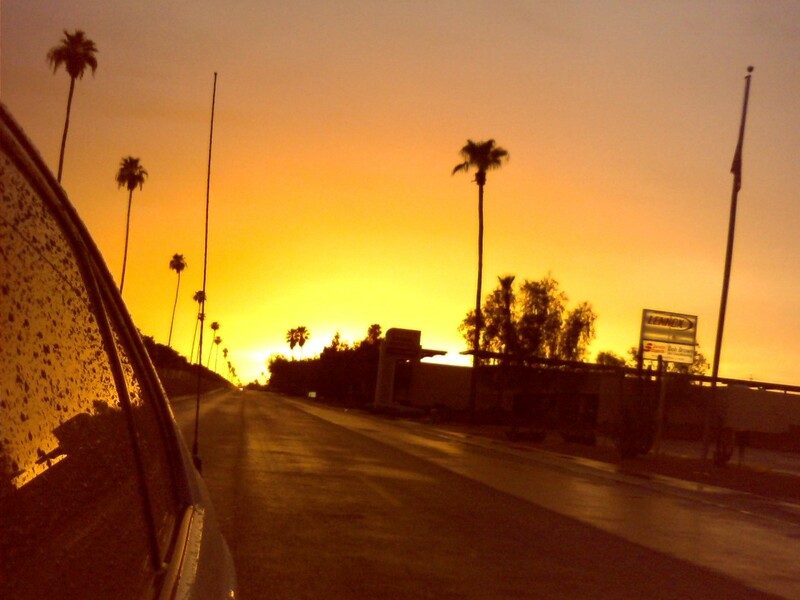 I love Arizona sunsets. I have seen many in different places around the U.S. and a couple in Mexico. They are all very pretty (except the ones on the East Coast-the trees block everything), but Arizona sunsets are powerful. On the beach, everything seems dreamy and in an ocean-spray kind of haze. Everything here is so sharp, like the city silhouettes were cut out from black construction paper and put against a bright backdrop. I love sharp contrasts like that. Taken with my camera phone in my backyard. I wish the RV place wasn’t there so we could get an unobstructed view of the White Tanks. Anyone want a blueberry muffin? I love cars, and I LOVE the color green. And this color, with thisvintage car is a dream come true. Does anyone know the make? Pretty as a picture on the Glendale/Peoria border. Check here every Saturday (or after that) for some gorgeous sunset shots!